"The Waves off the Coast of Kanagawa"
Katsushika-Hokusai, born in 1760, was a unique figure in ukiyoe who was constantly referred to as being "mad about painting". Completely seized by the demon of art, he devoted his life to his trade and did not lay down his brush until his death. 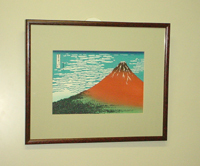 Hokusai's masterpieces are undoubtedly the 46 pictures of the 36views of Mt.Fuji. Hokusaiundertook thisseries while in the mid-60's, the prime of his life as an artist, and took almost 10 years to complete it. Mt.Fuji had previously been considered as only an object of worship among the people; Hokusai gave the mountain a new dimension by giving it artistic expression. 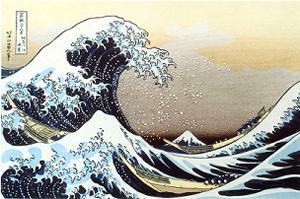 One can find in these pictures the essence of the art of Hokusai, who drew as many as 30,000 pictures. Hokusai spent his entire life closely observing objects and drawing them, and changed his residence as often as his art required - a total of 93 times.